Breeder: Donna & Liz Oster. Owner: Liz & Doug Oster & Frank & Kris Fasano. "A large masculine male. Beautiful type, plushy coat, excellent strong back. He is a very strong side mover. Could be cleaner in front. Overall a good one. The breeders can be proud to have bred this one." "Marquis’ Stealing The Show (Kenlyn’s Aries V. HiCliff x. Marquis’ Finesse---- A large substantial black and tan. Excellent bone and beautiful head. Good wither, hard back - good croup and tail set. Again for his age is good coming and going. This is a very powerful, extreme side gaiting young male who has a great future ahead of him - an easy class winner who also went on to Best Puppy"
"This is a fine, solid, powerful working dog. While I usually prefer a deeper body and more elegance, I could not deny this dog for he is a true athlete. The longer he gaited the better he became and it was very easy to visualize him herding sheep all day long. His perfect balance gives him a long, easy stride; his iron back and great conditioning gives him endurance. His handsome masculinity, good pigment and beautiful neck complete the total package. 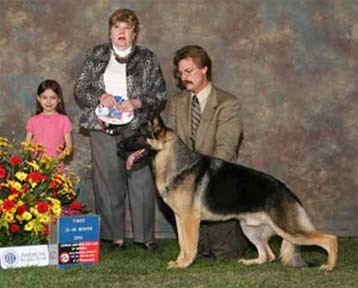 I was thrilled to learn that he was also Winners Dog in Canada this year." "Young, black and tan male with a good head, solid back and topline, good front and smooth outreaching side gait. A bit loose coming, good doing. About a year away." "Confident, noble expression. Strong head with compete dentition, scissors bite, dark almond eye. Black and tan pigmentation with a correct coat. He is a normal size dog of normal proportions with substantial strong bones, well developed musculature, a firm straight back, normal length croup with a correct tail set. With good feet and pasterns, he stands correctly in front and rear. He is sound coming and going with very good rear ligaments and tight elbows.l He has very good front reach and excellent rear drive. Beautifully presented by Kent Boyles, he is truly a working animal in excellent physical condition."